I had such fun with the cuttlebug the other day I made several of the backgrounds. Then cut and used them differently to create cards for some RAK's. 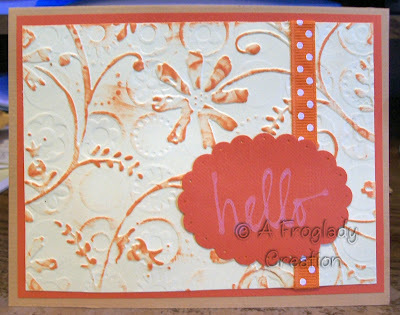 Here is another with some pretty polka dot ribbon and then using matching orange paper and my scalloped oval punch I made a hello to place on the front. 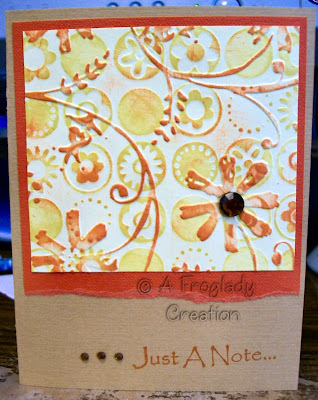 I think the flower on this one looks cool since the orange didn't completely cover it gives it even more texture. This one also has no Sunflower Ink swiped on it. This one I did with the Sunflower and Orangerie swiped background. Again though check out the flowers - I really like that part of it LOL! I added some faux jewels on this one and one as a flower center. I will definately be revitising this technique with different embossing folders and color choices.